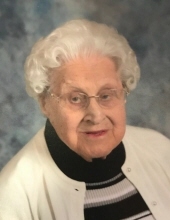 Betty Marie Perry, 96, of Waterville, OH, formerly of Whitehouse and Swanton, died February 2, 2019 at St. Luke's Hospital. She was born November 30, 1922 in Toledo, OH to Raymond and Florence (Ford) Wittes. Betty had been living at the Browing Masonic Community Residence since 2008. She worked as a packer for Perfection Finishing Company for 20 years, retiring in 1982. She was a past member of Neapolis Firemen’s Auxiliary and Whitehouse 55+ club. She married Guy H. Perry April 23, 1941. He preceded her in death. Survivors include, children, Leslie Perry and Janet (Larry) Poling, daughter-in-law, Kathy Perry, grandchildren, Shawna (Brandon) Figy, Kurt Poling, Kyle Poling, Brent Perry and Brooke (KJ) Majewski and 7 great grandchildren. She was preceded in death by her husband, son Arthur, grandson, Brandon and siblings, Chester Wittes, Vera Dohse and Eleanora Wagoner. Memorial contributions can be given to Browning Masonic Community or Bethany Baptist Church. To send flowers or a remembrance gift to the family of Betty M. Perry, please visit our Tribute Store. "Email Address" would like to share the life celebration of Betty M. Perry. Click on the "link" to go to share a favorite memory or leave a condolence message for the family.